W&L dancers Carissa Margraf and Amalia Nafal. 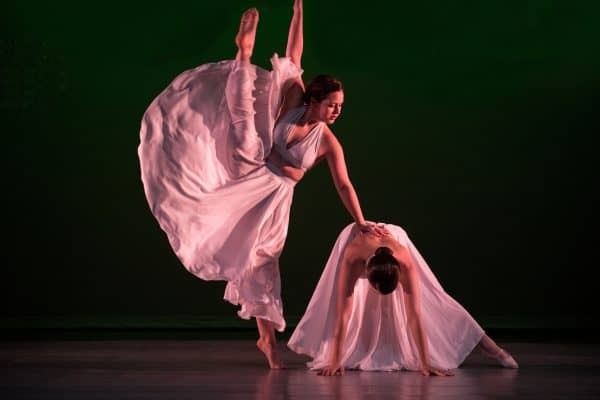 The Washington and Lee University Department of Theatre, Dance and Film Studies will present the award-winning W&L Repertory Dance Company and guest artists, March 15-17 at 7:30 p.m. in the Lenfest Center. This fully produced concert of eight works contains the work of four guest artist residencies that occurred throughout the year. Choreographers Autumn Eckman, Lauren Hall and Jordan Kriston each spent four days on campus offering master classes and teaching their choreography to W&L dance students. Nina Maria Donovan, a spoken-word artist, wrote the poem “Nasty Woman,” which was performed at the National Women’s March by Ashley Judd. Donovan will visit campus the week of March 15 as a guest artist. Her poem and performance were the inspiration for a large group dance created by Cate Peabody ’18. Donovan will recite her poem live on stage as an accompaniment to Peabody’s original choreography. Donovan is a sociology major with women/gender studies and Jewish/holocaust studies minors at Middle Tennessee State University. She will be on campus for five days interacting with students, performing and participating in campus life. In conjunction with the W&L’s Women’s, Gender and Sexuality Studies Program, she will participate in an Art and Activism luncheon during the week. Eckman was a scholarship student at the Houston Ballet Academy and is an Iowa Arts Fellow, where she earned her M.F.A. in choreography. In her 20 years as a professional dancer, she has danced and taught for Hubbard Street Dance Chicago, Luna Negra Dance Theatre and Giordano Dance Chicago, among others. Hall is a choreographer, teacher and dance media artist based in Los Angeles. She received an M.F.A. in dance from the University of California, Irvine, and has guest lectured and set choreography on university dance students throughout the U.S.
After receiving her dance degree from Arizona State University, Kristen joined Pilobolus Dance Theater, where she helped create over a dozen new works with the company. She has performed and taught movement collaboration workshops in almost all 50 U.S. states and several countries around the world. Tickets are required and can be purchased at 540-458-8000 or online.